Me... I just wanted to be able to create animated characters and props that I could import onto GoAnimate. Koolmoves has a dedicated Cartooning and Illustration mode which turns on all the software's advanced features. This can be a bit daunting so, if you're really new to the software, it's probably worth trying out the wizard and basic modes first and just seeing what you can do with that before taking the plunge into full on cartoon animation. Try some of the tutorials and task assistants as well. This review isn't intended to be a step by step guide to creating characters with Koolmoves. Instead I'll just highlight features that I liked and point out any difficulties I've had. For my very first animated character GoAnimator, Cool34606, agreed to let me turn his custom character, Kung Fu Cat, that I'd animated with before, into a true flash animated character. I chose his character because it was an original design and because Cool's drawings weren't too complex but weren't overly simple either. The first great feature, that I assume is standard in most cartoon animation packages, is the ability to import a bitmap image so you can trace it with vector lines. That meant I could just load in Cool's original drawings to trace my base figure from. The only problem I've had with this feature is that if you change magnification of your drawing it'll no longer match up with your trace image. Thus you have to choose a magnification before you start and then stick with it. Once you have the base figure it's relatively easy to animate most moves without having to redraw every frame. You just move the vector lines around on each new frame. The ability to 'onion skin' i.e. see previous and successive frames (shown below) comes in real handy. You can see as many previous or successive frames as you need. You can also view your image in wire frame mode if objects are obstructing lines on other frames that you need to see. Koolmoves does have a character 'bones' feature where by, in theory, you create a skeleton for you character so that instead of moving the vector lines themselves you just move the bone limbs around and the software will move your lines correspondingly. However I found it clunky and unusable and haven't tried to use them since. To be fair though even the user guide says their bones system is primitive so hopefully future versions will improve this feature. I've only delved into Action Script at a most basic level with my characters, using commands such a 'stop movie' and 'gotoAndPlay'. GoAnimate characters don't really support advanced action script commands. Koolmoves supports both Action Script 1 and 3 so if coding is your thing the software is very capable. Exporting your creation, options include; as straight flash movies, Flash/HTML embed, frame captures and Scalable Vector Graphics. 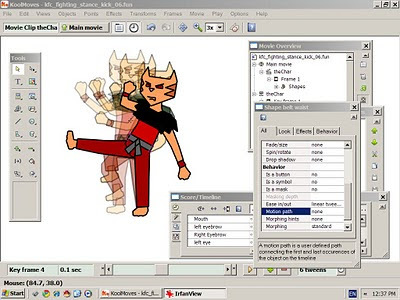 Below is my GoAnimate demonstration video for Kung Fu Cat which shows all of the initial moves I created for him using Koolmoves. It would be fair to say I've barely used Koolmoves to it's full potential. It includes many fantastic effect tools to create animated and 3D text. Drawing tools include the ability to create gradient fills, transparency, adjust line thicknesses and more. You can import video, audio and indeed, create entire flash animated cartoons with Koolmoves alone that you could upload to Youtube. The program is still a little buggy and has on occasion crashed on me but, if you save your work often this will hopefully not be an issue. For the shift into paid flash software from the extremely buggy Pencil Animator it is one giant leap for very little cost. I would definitely recommend it as an animators tool and for anyone who wants to try flash without the high cost of Adobe's Professional software. Note: If you're a GoAnimator reading this review, as of the time I wrote this article only GoAnimate Beta Testers are able to upload flash objects and characters. This may change some time in the future but, in the meantime, why not try Koolmoves and learn flash animation for yourself. Great review. I've been using KoolMoves for a while now, and I'd have to agree with everything you wrote. Just another note to GoAnimaters- You can't create Characters in the cartooning mode. KoolMoves is great for small stuff like making Sprites, but it seems to take a lot of system resources, and if you have too many objects on the scene it can get pretty slow. Also, if you have too many programs on while using KoolMoves it's bound to crash--even says so in the user manual-lol. The other thing is I'm finding it hard to learn actionscript because everything teaches it in Adobe Flash terms, which is really too bad. You're definitely right about it being a great price to find out if you want to move into Adobe Flash Pro, I've come to love working with vectors and hopefully will be moving into getting an Adobe Suite. I'd recommend purchasing KoolMoves to anyone who thinks they'd be interested in Web Design or Cartooning and animation. Thanks for the comment and additional information Coady. I haven't really tried to learn actionscript on Koolmoves because I just don't need it beyond the most basic of commands like being able to loop an animation back to a specific frame instead of the begining or to stop an animation from looping. Not sure what you mean by not being able to create characters in cartooning mode though? I use the software in that mode all the time. Koolmoves is missing a lot of advanced drawing tools that CS5 has so anyone who's serious about flash will probably outgrow Koolmoves over time. Wow Wonderful post,thanks for sharing this wonderful topic..